Live coverage of the North Korea-U.S. summit where Kim Jong Un and Donald Trump meet face to face. Hong Kong shares finished unchanged, with investors remaining in a defensive mood on persistent concerns over North Korea. The Hang Seng index was unchanged at 27,741.35 points, while the China Enterprises Index, a gauge of mainland industry leaders listed in Hong Kong, gained 0.1 percent, to 11,191.59 points. Gains were led by property developers, as top developer China Vanke posted solid sales growth in August. Shares of the dual-listed property giant jumped as much as 7.2 percent to a record high in Hong Kong, after it reported a 47.3 percent increase in contract sales for the first eight months of the year. Material shares also held up with a 0.7 percent gain, thanks to a weaker dollar and expectations China's economic growth will largely remain solid through year-end. Reflecting relevant strength recently in the mainland market, as well as the impact of a resurgent yuan, an index tracking Chinese shares' premium over their Hong Kong peers stood at 133.73 before hitting the highest level since July, 2016. 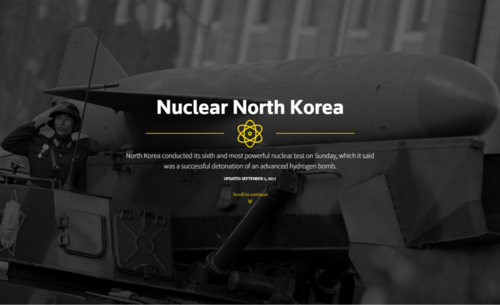 Nuclear North Korea: What you need to know about North Korea's nuclear program. View our interactive graphic here. U.S.Asian shares eked out small gains on Tuesday as expectations that Beijing will maintain support for its economy ahead of a key congress supported Chinese stocks and metals prices, but worries about North Korea kept many investors on edge. U.S.Russian President Vladimir Putin said on Tuesday that imposing tougher sanctions on North Korea over its nuclear missile programme would be counter-productive and said threats of military action could trigger "a global catastrophe". U.S.German Chancellor Angela Merkel and U.S. President Donald Trump condemned North Korea's nuclear test during on Monday and urged the United Nations to quickly agree on tougher sanctions against Pyongyang, a German government spokesman said. Decorated by Pyongyang but blacklisted abroad, two scientists pictured with North Korea’s leader ahead of Sunday’s nuclear test play vital roles in the reclusive country’s pursuit of a powerful weapon capable of striking the United States, experts say. U.S.South Korea said on Tuesday an agreement with the United States to scrap a weight limit on its warheads would help it respond to North Korea's nuclear and missile threat after Pyongyang conducted its sixth and largest nuclear test two days ago. ReutersThe United States and South Korea will go ahead with joint military drills next week, the top U.S. military official said on Thursday, resisting pressure from North Korea and its ally China to halt the contentious exercises. ReutersNorth Korea says it has developed intercontinental missiles capable of targeting any place in the United States. ReutersEuropean stocks and bond yields fell in early trade on Thursday after the Federal Reserve expressed concern over weak U.S. inflation, a trend which has clouded the outlook for the world's largest economy. ReutersThe "wrong" actions of the United States on Taiwan, its South China Sea patrols and deployment of an advanced anti-missile system in South Korea have had a large, negative influence on military trust, a senior Chinese officer said on Thursday. North Korea would be "crossing a red line" if it put a nuclear warhead on an intercontinental ballistic missile, South Korea's president said on Thursday, but the United States had promised to seek Seoul's approval before taking any military action. Asian stocks edged up on Thursday as tensions between the U.S. and North Korea came off the boil, while worries about President Donald Trump's ability to implement his pro-growth agenda and the Federal Reserve's concerns about low U.S. inflation hit the dollar. U.S. President Donald Trump on Wednesday praised North Korean leader Kim Jong Un for a "wise" decision not to fire missiles toward the U.S. Pacific territory of Guam, which has eased escalating tension between the two countries. South Korean President Moon Jae-in said on Thursday U.S. President Donald Trump has promised to seek Seoul's approval before pursuing any option against nuclear-armed North Korea. Germany's Merkel says - I will do all I can to achieve a peaceful solution on North Korea. Reuters UKU.S. President Donald Trump praised Kim Jong Un, the leader of the North Korea, on Wednesday for delaying a decision on attacking against the U.S. territory of Guam and pausing an escalation in tensions between the two countries. North Korea Kim Jong Un has delayed a decision on firing missiles towards Guam while he waits to see what the United States does next, the North's state media said, as South Korea's president said Seoul would seek to prevent war by all means. North Korean leader Kim Jong Un has delayed a decision on firing missiles toward Guam while he waits to see what the United States does, the North's state media reported on Tuesday as the United States said any dialogue was up to Kim. Russian Foreign Minister Sergei Lavrov discussed the situation on the Korean peninsula with his Chinese counterpart Wang Yi, RIA news agency cited the Chinese Foreign Ministry as saying on Tuesday. There are many difficult issues between the United States and China but both share a commitment to work through them, the United States' top general said on Tuesday during a visit to Beijing amid tension over nuclear-armed North Korea. Chinese Foreign Minister Wang Yi told his Russian counterpart in a telephone call on Tuesday that it is urgent that the United States and North Korea "put the brakes" on mutually irritating words and actions, the ministry said. North Korean leader Kim Jong Un has delayed a decision on firing missiles towards Guam while he waits to see what the United States does, the North's state media reported on Tuesday as the United States said any dialogue was up to Kim. "The dangers of a conventional war on the Korean peninsula, particularly North Korean conventional artillery strikes on the South Korean capital of Seoul, were enough to deter Presidents Bill Clinton, George W. Bush and Barack Obama from taking military action against Pyongyang. North Korea’s latest missile tests arguably put even further pressure on Trump to make the same calculus." - Read Peter Apps' latest column. North Korea said on Tuesday now is not the right time to discuss U.S. citizens it has detained, given the state of relations between the two countries, its official KCNA news agency said citing a foreign ministry spokesman. North Korea's leader has delayed a decision on firing missiles towards Guam while he waits to see what the United States does next, the North's state media said on Tuesday, as South Korea's president said Seoul would seek to prevent war by all means. North Korea offered a glimpse into its plans to fire missiles near Guam in photos released by its state media on Tuesday, as leader Kim Jong Un was briefed on the plans drawn up by the army amid heightened tensions with the United States. The United States could tighten a global economic noose on North Korea by pushing for further United Nations sanctions likely targeting Pyongyang's textile exports and supplies of oil to the government, diplomats say. U.S. Defense Secretary Jim Mattis said on Monday that if North Korea was to fire a missile at the United States, the situation could escalate into war. North Korea's leader has delayed a decision on firing missiles towards Guam while he watches U.S. actions a little longer, the North's state media said on Tuesday, as South Korea's president said Seoul would seek to prevent war by all means.